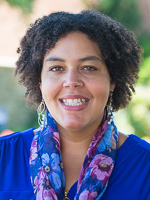 Roxann Allen Kioko (Roxy) teaches courses on management and research methods at the Department of Business & Economics, the Organizational Leadership Studies graduate program, and the Center for Justice & Peacebuilding at Eastern Mennonite University. Roxy has worked in research, operations, management, training, and consulting roles in various contexts in the U.S. and abroad, including positions at Mennonite Central Committee, the Great Place to Work Institute, Humentum, the New Venture Fund, and Cooperative by Design. Her consulting clients range from small religious congregations to cross-sector community coalitions, and she enjoys helping them further their missions through strategic planning and change management. She holds a PhD in Strategic Leadership with a focus on Nonprofit and Community Leadership from James Madison University.